NBC set to experiment with their NASCAR booth setup in order to accommodate Dale Earnhardt Jr.
Could a four-man booth be in the works for NBC's NASCAR coverage? Newly retired and new father Dale Earnhardt Jr. is coming to NBC this summer. 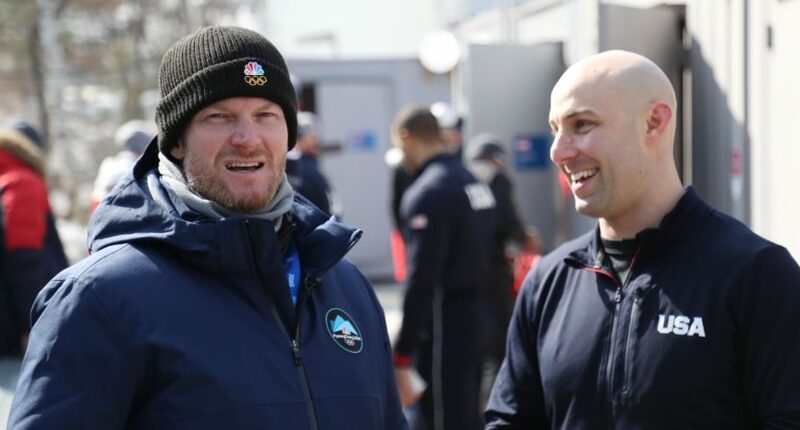 Before NBC takes over the NASCAR schedule from Fox on July 1, they have had Dale Jr. working their big events such as the Super Bowl, Winter Olympics and Stanley Cup Final along with weekly appearances on NBC’s studio show NASCAR America. Less than a month away, Earnhardt is set to factor into NBC’s NASCAR broadcasts and that likely means putting him in the booth as an analyst. The issue is that along with play-by-play guy Rick Allen, Jeff Burton and Steve Letarte are already in the booth as commentators and are well respected by fans and the media. So while sports broadcasts have typically done a two or three-person booth, Adam Stern of SportsBusiness Journal reported that NBC would be experimenting with their booth setup and that may mean a four-man booth that will include Dale Jr.
.@NASCARonNBC will experiment with different booth setups throughout its half of the season, per sources, its first with new analyst @DaleJr. The four-man booth theory was fueled after a fan asked Earnhardt about the plan and he said that everyone is going to be in the booth. I’ve always seen myself as a “less is more” person. Three-person booths seem to have too many people talking at once and it distracts from the event. Having said that, the only sport I have really preferred a three-person booth over a two has been in motorsports because you can have a driver expert and crew chief expert bring their own levels of expertise to the broadcast. And that’s what NBC does. Jeff Burton was the driver, Steve Letarte was the crew chief and both will be future hall of famers. So now with that, they have a great three person setup along with Allen. With the addition of Earnhardt, I’m not saying he’s going to make the broadcast worse. If anything, I’m looking forward to Dale Jr. because I think he’s going to improve the broadcast but I’m worried about having too many people in the booth and someone gets the short end of the broadcasting stick at times. It’s important to note that nothing is official and at the very least, NBC will test different scenarios. Maybe a situation where two people are in the booth and two people are out on a pit box on pit road may work. Last year, NBC utilized a system at Watkins Glen similar to a radio broadcast where commentators were placed all around the track and each took turns calling the race as the leaders enter their part of the track. Maybe NBC does something like the Premier League where they have three commentators and have two of them in the booth each week while the other may be down on pit road and they’ll alternate each week. The fact is that NBC is willing to make this work and is willing to figure out what the best situation is before going forward. And if anyone can make a four-person booth work, it’s going to be NBC’s NASCAR crew.